The Only Cafe and Backpacker is housed in a 3-storey earthy yellow building with a 70s' Soviet Union style. The Blue and White Porcelain style will leave you a special impression and remind you of some cherished memory of ancient China. It is located in the very spot where is approximately 10 metres from Daxigou Subway Station (Line 2 Exit A). The hostel offers a cup of fresh latte as a welcome drink upon check-in. We offer free WiFi throughout the house. Guests who are coming from Jiangbei International Airport or North Chongqing Railway Station can take subway Line 3, interchange Line 2(heading Jiaochangkou) at Niujiaotuo Station, and get off at Daxigou Station (leave from Exit A and turn right; our hostel is about 10 meters away from you). For those who are coming from Chongqing Railway Station, Bus 862 can reach our hostel at Daxigou Station with 4 stops and another 2 minutes' walk. It has everything you want in a good hostel. So each dormitory in the Only Cafe and Backpacker is fitted with clean bedding. The 24-hour front desk can help you with luggage storage and tour guidance. Guests can enjoy a cup of coffee in the cafe or have some drinks at the bar. Doing some reading in the mini library is also a good choice. The setup is a little unusual: the square-sized hostel has an open courtyard in the middle, so the place is well-lighted and well-ventilated. On a rainy day an overhang directs water safely into a plant bed. 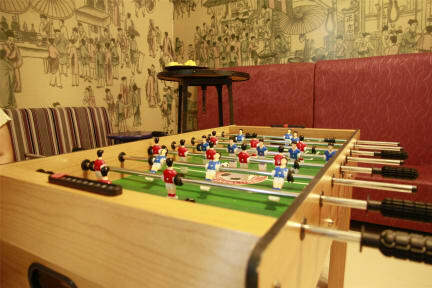 We have a big and comfortable seating area with a decently stocked bar, pool table and board games. Rooms are comfortable with everything you'd expect and the beds are decent. The place is decked out in some beautiful repaired antique furniture, some of which even can date back to the Qing dynasty. And some cool and nostalgic posters from the 1920's ancient China are dotted around the walls. The whole thing looks fantastic and we would like to share the stories behind it with you. It only takes a 5-minute walk from our hostel to Chongqing's Great Hall of the People and Three Gorges Museum. Located near the metro station, it's easily accessible to some tasty noodle, hotpot and local restaurants just around the corner. At night, you can take a casual walk beside the JiaLing river, enjoy the night view of this amazing city. 4. At least 1 day advance notice for free ancellation. This is an amazing place to stay while in Chongqing. The hostel is located close to many attractions it is very clean and you are going to get even a coffee for free. The stuff is extremely nice and professional. I called the hostel after midnight to check if they can accommodate me the same night, they agreed and waited for me. Tnx a lot for everything best service I ever received while in China. I seldom write reviews, but liked this place so much, that I have no choice-:) The location is unbeatable, the stuff is enthusiastic and helpful and the atmosphere is really personal. I will definitely go again. Good location, literally 10 meters from Daxigou metro stop. Staff were super friendly and helpful. Free Coffee on arrival is a lovely touch too! Rooms are very spacious and bathroom is clean. Would stay again no problem. Wonderful staff and a beautiful hostel. The owner is an amazing guy with love for his guests and his city. They also have the most unique map of their city I've ever seen, fully hand drawn. Location very strategic. Staff very friendly. Nice place to stay quite near the Jiefangbei area. Got a complimentary coffee from the cafe as it was New Years eve. But be careful of the cat in the public areas.. nice and well-kept facilities in a cold city like Chongqing. I only spent one night but my overall experience was really good. Great staff, great coffee and cute clean hostel. The staff spoke perfect English (one of the guys even spoke German) and was VERY helpful, they answered all my questions about things to do in Chongqing, how to get there etc. There's not much to do close to the hostel, but there's a subway station right around the corner so very convenient. However, the room was cold, and you could enter without a card. The lockers are small and don't fit a backpack. I was alone in a 8-bed dorm for 2 nights so not the best atmosphere.